Garden of Aaron: War or Peace in the Garden? Do you believe that gardening inevitably involves warfare with insects, diseases, moles, voles and Mother Nature herself? But I heard a talk last month at a gardening society meeting in which I felt the speaker came down more on the side of the Warrior ethos. That's the one where a vole eating the roots of a prized plant deserves to be executed. Moles digging up the lawn are similarly condemned. Insects are to be dealt with by insecticides. Diseases are to be managed with sprays and potions. I'm not sure that I agree with any of that. Oh I understand the dangers of being an extremist, so I'll admit preemptively that there may be circumstances where active intervention is warranted. But overall, I instinctively side with the non-interventionists. 1) I don't see the pleasure in gardening as warfare. I find gardening to be a relaxing and beautiful pastime, both in the activity and the results. I garden to get closer to nature, not to attack it. 2) I don't need the fruits of my garden in the way that other creatures might. If I see a caterpillar eating leaves in my garden and I kill it, I might never get to see the butterfly that follows. If a squirrel bites the head off a sunflower, I don't start plotting the rodent's demise, I figure there are more than enough flowers to go around. (Although it does irritate me that squirrels will eat half a sunflower head and then move on to the next one.) If you garden for survival crops, I think you are far more justified in taking whatever steps are necessary to ensure as little damage to your crop as possible. That said, maximal intervention may not always be the best course anyhow (see below). 4) I worry about the externalities. Externalities are all those repercussions that may be invisible to you, but that occur nonetheless. For instance, imagine that while spraying pesticides to control a pest insect, you accidentally hurt some bees, which then take this chemical back to their hives, which ends up disrupting the entire hive and leading to its collapse, which then eliminates the bees that were needed to pollinate a whole range of other plants, etc. etc. That's just one example of an externality. Another might be runoff from fertilizers and pesticides polluting rivers and streams. A poisoned crow that ate a poisoned vole could be an externality too. Or how about tens of millions of birds dying from pesticide use on farms? Or even just the environmental costs of producing the many 'inputs' on which gardening supposedly relies - all those packaged fertilizers and amendments have to come from a factory somewhere, and that factory produces pollution, and the trucks carting the amendments to the store produce pollution, and your car trip (presuming you drive) back and forth to the store produces more pollution. Or what about the peat bogs exploited so that gardeners can have more perfect soil? And all those externalities need to be figured into the "cost" of that tomato or flower you snip from a garden that has been sprayed and amended. A garden where you declared victory over nature. I like tough plants. Those are plants that survive on their own without any herbicides or pesticides, plants that fend off predators and diseases, plants that attract the beneficial insect allies they need to ward off the 'bad' guys. I like plants that grow in the soil I've already got. It's not textbook soil - that mythical crumbly black loam that is perfectly pH balanced and moist but not wet. It's clay soil. Heavy clay soil. The crappy clay soil that comes from someone scraping off the topsoil six or seven years ago to build a house. It takes time and effort to nurture that soil into something better. Sure, I could truck in amendments. I've tried adding some and will probably need to add others in the interests of time, but I believe a better way would be to rely on cover crops and earthworms and bacteria to amend the soil for me. I'm still learning about all that. I don't claim to be an expert. But it seems by far the better and more sustainable way. I think gardening at some level is an expression of a very human desire to be needed. I believe that's one reason we get married, have children, adopt pets and take a trowel or a hoe or a mower to the land in an attempt to shape it, to make it better, to make it ours. But nature truly does not need us. In some cases, we've screwed things up so much that we've made it dependent on us. In other words, by destroying native habitat and planting a near-monoculture of often biologically exotic and useless (from a widlife perspective) plants we may have changed our landscapes to the point where birds do actually depend on birdfeeders for survival. But before we messed things up, nature often managed to do OK on its own. No one tended the virgin forests. Or the grasslands. Or swamps. Or meadows. And yet somehow these places were alive with a diversity of plants and animals and insects, with fruits and seeds and nuts, with flowers and cones and ferns, with rich and natural communities. So how can we get a little closer to these idealized self-sustaining and nurturing states of nature? 1) Pick tough, zone-appropriate plants that don't need pampering. Native plants are often (but not always) among the tougher plants you can find that are already adapted to your environment. 4) Decide on what level of intervention you find appropriate and enjoyable. For instance, I do water my garden, especially newly established plants, as well as annuals and vegetables that need more water than Nature provides at times. But I certainly look for drought-tolerant plants that are able to withstand hot and dry spells in the summer -- while still being adaptable enough to survive in heavy clay soil during spring downpours. I very rarely spray any sorts of chemicals (herbicides, fungicides, etc.) I do look for plants that are marketed as being resistant to disease and insect damage. 5) Look for perennials you can propagate or annuals that will self-sow (or whose seeds you can save for later sowing). Either way, you'll get a bit closer to a self-sustaining permaculture, and take a step away from the idea of gardening as just one more consumer sport that requires constant trips to a gardening supply store. 6) Try to add plants to your garden that will attract beneficial insects and animals that will be your allies in the garden. 7) If a plant does not survive, replace it with something tougher. Now Lord knows I am not a perfect follower of these rules. In a recent post, I wrote about ripping out English Marigolds when they got infested with leafhoppers. I didn't just let nature take its course, as some of the commentators on this blog indicated they would have done. (I was worried about the leafhopper infestation spreading if I let events run their course.) But I also didn't reach for a can of chemicals. Some Warrior Gardeners might have said, "I want English Marigolds in my garden and I'll be darned if I'm going to let any insect get the better of me!" As for me, I know there are dozens if not hundreds of other flowers that I can try in the garden. Surely among these, I'll find some that can thrive here in Middle Tennessee and defend themselves with little help from this Peaceful Gardener. Did Tolstoy have an email newsletter? I think not! But Garden of Aaron sends free email updates. Wow, this post is so thoughtful and thought-provoking. I agree with everything you've said here, although I don't always follow it as I should either. As for voles, I have some in my garden and have never done anything to get rid of them. The rabbits, squirrels, and chipmunks seem to do more damage. But for all of them, I've learned ways to repel them from my favorite plants, or I stopped trying (no Tulips for me here at this location anymore). Great post! Thanks for your nice comment :) And thanks for reading this magnum opus. Please do share some of your coping strategies for repelling rabbits, squirrels and chipmunks from your favorite plants. For instance, I don't mind sharing the sunflowers with the squirrels, but I do get a little peeved when rabbits (presumably) chow down on vegetables like swiss chard. I suppose fencing parts of the garden might help? I basically agree with your approach. I never use insecticides. I have protected some young woody plants with hardware cloth during winter and have used some stinky animal repellent sprays. It that's warfare, it's purely defensive. 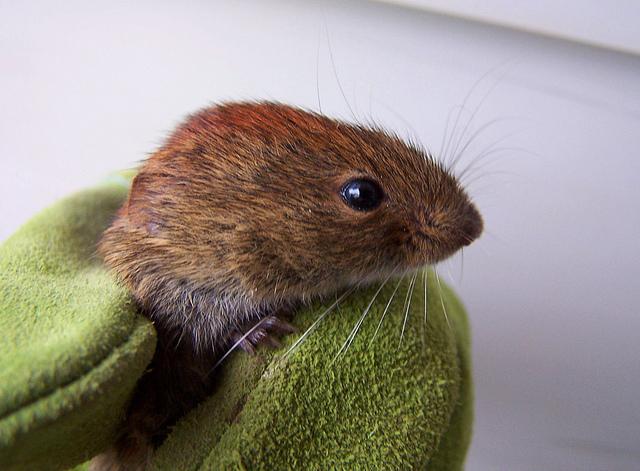 ...and a cute picture of a vole, too. I garden to attract wildlife, so having them in the mix is part of the plan and pat of the reward. Here's hoping the wiser and kinder philosophy will overcome the warrior one.